Mondelez agreed and started working on a redesign. In the meantime, the crackers' namesake circus -- Ringling Brothers and Barnum and Bailey -- folded for good. The 146-year-old circus, which had removed elephants from its shows in 2016 because of pressure from PETA and others, closed down in May 2017 due to slow ticket sales. 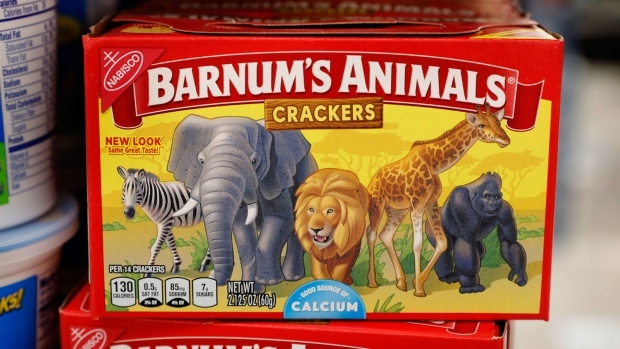 The redesign of the boxes, now on U.S. store shelves, retains the familiar red and yellow coloring and prominent "Barnum's Animals" lettering. But instead of showing the animals in cages -- implying that they're travelling in boxcars for the circus -- the new boxes feature a zebra, elephant, lion, giraffe and gorilla wandering side-by-side in a grassland. The outline of acacia trees can be seen in the distance. PETA Executive Vice-President Tracy Reiman says she's celebrating the box redesign for the cultural change it represents.